Compared to most sports coats, which are at home in the country, the navy blazer is better suited at seaside and resort towns. However, the single-breasted navy blazer is one of the most versatile sports coats, and due to its solid navy colour it can just as effectively be dressed up in the city as it can be dressed down at a resort. 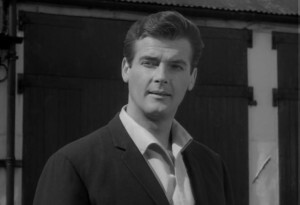 Roger Moore playing Simon Templar shows a great example of the latter when he wears his blazer in the 1965 episode of The Saint titled “The Spanish Cow”. 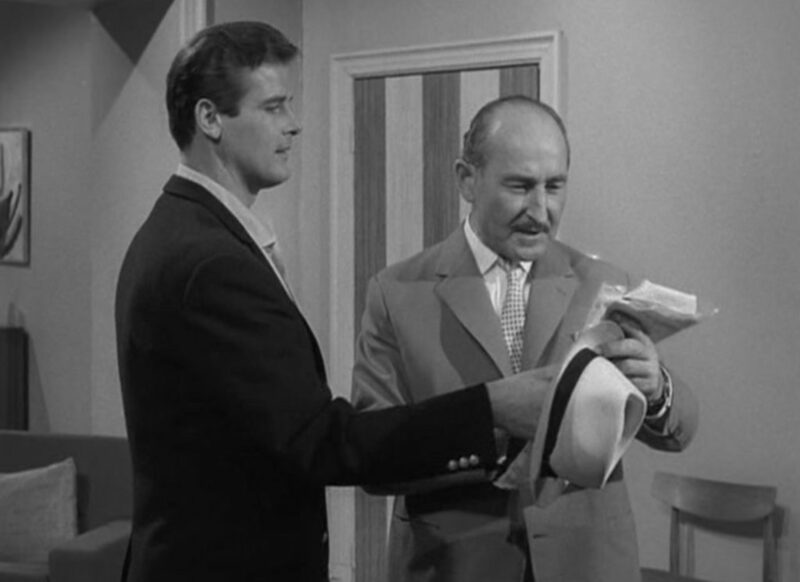 In the first through fourth series of The Saint from 1962 to 1965, Moore often wears a button three, wool navy blazer with straight flapped pockets, a ticket pocket, three buttons on the cuffs and a single vent. Tailor Cyril Castle made no less than two examples of such a blazer made since it saw more wear than any other item of clothing in the show. The blazer in “The Spanish Cow” isn’t much different than the blazer that Moore wears in the first episode of The Saint three years earlier in 1962, except the cloth is lighter, the shoulders are softer and the lapels are just a little narrower. The fashionably narrow lapels, however, look disproportionately narrow and are somewhat unflattering on Moore. So how does Moore dress down his navy blazer? Underneath the blazer he wears a light-coloured camp shirt with a straight, untucked hem. The shirt has a one-piece camp collar that stands up nicely inside the blazer’s collar, which is the key to successfully wearing any shirt other than a formal shirt under a jacket (unless you like to wear t-shirts under your jackets). And because the shirt has a camp collar and not a more formal collar, Moore doesn’t have to worry about people thinking he forgot his tie. In the 1960s, wearing a formal shirt without a tie wasn’t done. It wasn’t something that James Bond ever did in the 60s, unless you count Sean Connery’s pink shirt in You Only Live Twice. Simon Templar rarely did it. Moore’s trousers are stone-coloured cotton and have either a flat front or darted front and a plain hem. He wears canvas slip-on shoes with white rubber soles, and he matches his white socks to the soles of his shoes. Essentially, Moore put his tailored blazer on top of a very casual outfit, and it works successfully. The blazer’s soft, natural shoulders help it to work better when worn casually. Templar: And how is the most efficient chief of police in the South of France? Latignant: On your behaviour in the South of France. Templar: My behaviour everywhere is impeccable. Latignant: So is your taste in shirts. These are magnificent. Templar: Sulka makes them for me in London. In my humble opinion, this outfit would be better of Moore had gone sock-less. Yup. 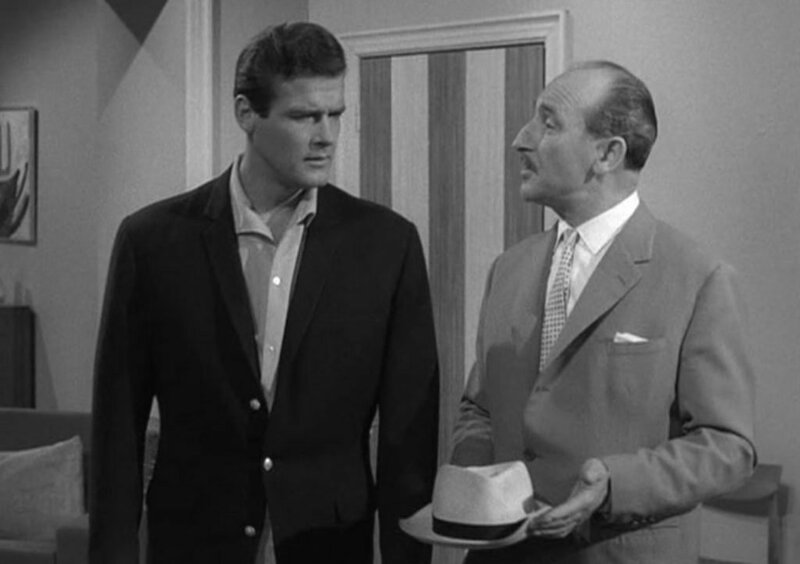 I like and wear generally narrower lapels than most people would choose, but even with that in mind, I caught a few early episodes of The Saint recently (I wish they would be shown at a regular time not just thrown in as filler shows here and there!) and noticed that RM’s lapels seem slim to the extreme, especially considering his broad shoulders. So far, I haven’t been impressed by much of “The Saint’s” wardrobe. Roger Moore’s broad frame just doesn’t mesh with the extreme slim fitting 60’s styling. He looks much better in symmetrical and proportionate tailoring. I tend to agree; the tailoring itself is quite good in terms of fit, but the narrow lapels and stovepipe pants don’t do Moore any favors. All this reinforces my conviction that true, attractive style is not a matter of opinion or fashion, but rather a matter of objective balance and proportions. Call me a Platonist dinosaur! The combination of soft shoulders and narrow lapels makes the blazer seem a bit like a bathrobe – which goes with the casual vibe. I’m guessing the blazer looks better dressed down than up. Was there a flood in this episode? It looks like he’s waiting for one in those pants. Well,the problem with Sir Roger is that it was too much,overly, “up to date” (a malicious could say that was a fashion victim). In some periods the fashion trends are not well on him; for exemple very narrow lapels and stovepipe trousers are terribles on him (and with these exreme proportions terribles on almost every man ). 70s fashion serves it better,also if occasionally he indulges on frivolous details. 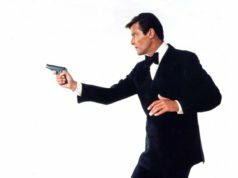 For me his best wardrobe is in “Live and let die”,and especially in “The man with the golden gun”. I wonder if the lapels were tailored to a specific width instead of relative to the other dimensions of the blazer? Those lapels look silly on a jacket with that much drape. The jacket has a full chest, but not much drape. lot of wear over the 3 years of the black and white series. For me, the “Saint” suits improved as the series went in to color or at least these later suits had more of Castle’s flair brought to bear. 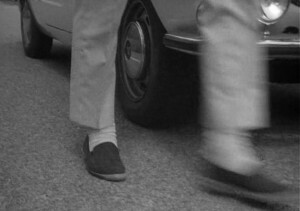 This developed in The Persuaders and on in to the first two Bond’s he produced for. 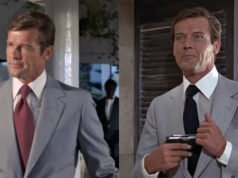 The “Saint” suits from the early series were, as noted above, certainly of their time and, I agree, some of their features weren’t the most flattering to Moore’s physique but, like them or not, Moore’s wardrobe whether as Templar, Sinclair or Bond, always fitted him impeccably.